Online shopping has become quite popular in towns and cities, because of the convenience it offers and a wide range of offers and discounts. According to a survey which was conducted in the year 2017, 73% of Indian online shoppers faced challenges such as product returns, lost products, shipping, miscalculated duties and so on. Many customers were even cheated by sellers. 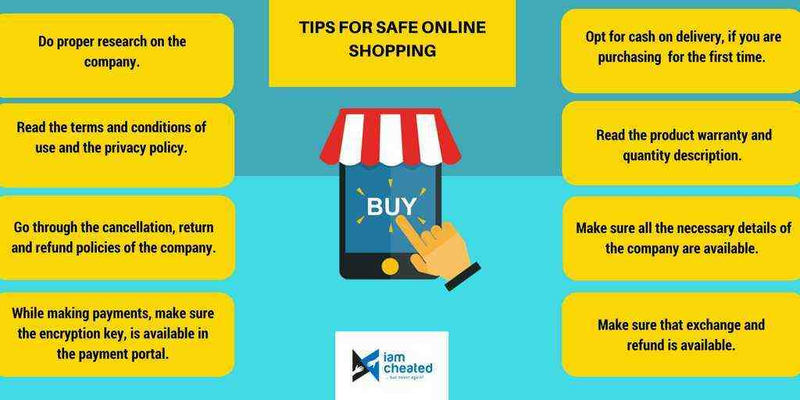 In this article, we will discuss some of the tips for safe online shopping. Before buying products from any unknown e-commerce companies, do proper research on the company. If you have any doubts regarding the company, do not purchase from it. It is advisable to opt for cash on delivery, if you are purchasing from an e-commerce company for the first time. Make sure all the necessary details of the company such as address, email and helpline number are available. Go through the cancellation, return and refund policies of the Company. Read the product warranty and quantity description, properly. Before making the payment, make sure the product would be delivered to your postal address. Store the screenshot of the product purchased. If the company changes the price or product description at a later time, this could be really useful. Some e-commerce companies do not exchange the product or refund the money. So, before making the payment, make sure that exchange and refund is available. According to the Consumer Protection Act, companies have to make an exchange/return/refund, if the product is defective. While making payments, make sure the encryption key (a small key symbol), is available in the payment portal. This ensures security of payments. Do not keep the product if you are not happy with it. Contact the customer care of the company and file a complaint.